The emergence of Southeast Bank Limited into banking industry of Bangladesh was at the stage of liberalization of global economic activities in 1995. The experience of the prosperous economies of the Asian countries and in particular of South Asia; has been the driving force and the strategic operational policy option for the Bank. The philosophy of the bank is “A Bank with Vision” has been precisely an essence of the legend of success in the Asian countries. Southeast Bank Limited was established in 1995 with a vision to become a leading banking financial institution of the country and contribute significantly to the growth of the national economy. It is one of amongst the fast moving, conventional financial institution; a scheduled private commercial bank which established under the domain of Bank Company Act of 1994 and incorporated as a public limited company under Companies Act, 1994. The Bank started commercial banking operations effective from May 25, 1995 with an Authorized capital of Tk 500 million and Paid up Capital of Tk. 100 million. During this short period of time this organization has managed to successfully position itself as a progressive and dynamic financial institution of the country. The financial strength of its portfolio has upward trend for several years. The bank obtained mentionable achievement within a period of 15 years of its operation and met up requirements of Bangladesh Bank. In the recent period of the economic slowdown, the banks asset and investment portfolio is fair enough than other banks. The bank had been widely acclaimed by the business community, from small entrepreneurs to large traders and industrial conglomerates including the top rated corporate borrowers for its forward – looking business outlook and innovative financial solutions. The products and services provided by this bank is wide and competitive, includes conventional deposit-loan products, trade finance, project finance, risk management, underwriting, foreign exchange, guarantees, credit and debit cards, Islamic banking and many more. Within a very short interval of time, it has been managed to create good brand image and significant reputation in the banking industry. Presently, it has 88 branches all over the country. It maintains correspondence with more than 25 foreign financial institutions in business intensive countries of the world to bolster the trade finance and foreign exchange activities. It also has planned the spread its name and credentials across the country. Measuring Customer Satisfaction Level of Credit Cardholders of Southeast Bank Ltd. Page 3 Southeast Bank Limited has consistently turned over good returns on assets and capital. The bank has maintained good proportion of debt-equity and reserve ratio in considering the betterment of its stakeholders. In spite of complex business environment and default culture, quantum of classified loan in the Bank is very insignificant and stood at less than 1.13%. It has been growing fast as one of the leaders of the new generation banks in the private sector in respect of business and profitability as it is evident from the financial statements. The bank has been graded a top class bank in the country through internationally accepted CAMEL rating. The banks decision making authority is chaired by great business professional and tycoons who are leading the bank to a new height in this competitive market place by using their expertise, knowledge and visionary attitude towards growth. They are struggling to create an environment of trust and discipline that will drive the employees to the objective. The human resources of the bank is perfect blending of all types of professional, they have a strong focus of women employment and indiscriminating business practice. They also conduct high degree of social welfare activities through the SEB Foundation to support the underprivileged classes in education, health, agriculture, training and empowerment also to other socio-economic development sector. In a nutshell, SEBL is determined to remain competitive and contemporary to the market and industry upon major business and performance evaluators. The principles of doing business are an integral part of organizations‟ operation, function, prospect and positioning. The principles include its mission, vision, objectives, commitment and competitive edges. Vision: – The vision is the condensed figure of mission is long-term and their missions are linked with vision. Objectives: – Southeast Bank Limited is designed to provide commercial and investment banking services to all types of customers ranging from small entrepreneurs to big business firms. In this regard it emphasizes on the priority sectors of the economy like agriculture, industry, housing and self-employment. Besides, the bank aims to provide different customers friendly deposit and loan products in the field of personal banking to fulfill the bank needs of individual customers. Taking part in the economic growth of the country. Eradicating poverty and doing social services by establishing Schools, Madrashas, University, Hospitals, Public Library etc. Commitment: – The bank has outlined some commitment criteria to clients when started the business. Southeast bank provides a wide variety of banking products and services to different category of customer in response to their need of banking. They have clustered the product and services into several segments which are directed and operated by independent divisions. Each product and services has numerous rule-regulations, term-conditions, fees-charges and distinct characteristics. For the sake of simplicity and relevance, I am skipping those particular parts which can be seen at internet or any brochures. b) Islamic Banking: – The bank offers similar type of banking product on the basis of Shariah law of Finance and Banking so that the majority people or Muslims can follow the religious instructions in every sphere of life. The brand name of Islamic banking is „Tijarah‟ which offers interest-free concept of banking. c) Loans and Advances Product: – The bank offers wide range of different funded and non-funded loans and advance products in name of working capital finance, project finance, syndicated finance, trade finance etc. d) Services: – The bank provides some direct service to its customers. The benefit that SEBL provides to its customer in terms of deposit schemes is very competitive. It is the benefit for which people from different classes comes to the bank and fixes their amount into a scheme. There are different types of schemes available to customers to invest. The difference between the deposit schemes mainly are interest rate, time and distributed interest. Each schemes charges 10% excise duty upon distributing interest to an account. The customer gets his principal amount the end of maturity. If anyone encashes the scheme before maturity, will get regular interest only. The interest is fixed by the policymakers of the bank with the help of treasury division. The central bank has instructed to define the spread of interest up to 3% which means if the lending loan interest is 15%; the deposit interest given to customers can not be less than 12%. Some bank can also use special consideration in deciding interest rate upon the amount and party reputation. The interest rate on schemes generally moves lower of remains stable for a long period. The primary instruction on interest rate is generated by central bank upon discussion with bankers committee. To achieve the mission and objectives in a competitive manner, the bank should employee experienced and talented human resources so that the task can be fulfilled accurately and effectively. A group of efficient professionals is needed to sustain in the market, convince several parties, conducting operational and technical activities. A well-educated, skilled and enterprising workforce with high experience in the banking is a precondition for the continued growth and progress of any bank. SEBL‟s aim is to recruit and retain a competent workforce where they will get attractive benefit packages, work environment, growth potential and job satisfaction. Commercial banks in Bangladesh are now paying high salaries to get the best workforce. SEBL is also providing some regular benefit packages to its human resources which may increase this year to motivate the employees. This is because of continuous growth of similar service oriented local bank along with special service providing foreign bank due to globalization. In this respect, Southeast bank is directed and operated by a team of sound professionals. It is managed by a team of professionals having long-term experience in the banking industry at home and aboard. While the board sets the management objectives and policies, the management is instrumental in providing the inputs and implementing the strategies set by the board. The policy and decisions made by policymakers are followed by the top level of management who break down the policy or decision into easily perceivable way. Then it‟s being distributed to different division so that it‟s disseminated to the lower level more specifically. The decision-making authority doesn‟t lies only policy makers, beside it‟s decentralized to some extent on the basis of weight. The major decision on fund movement, risk management, financial adjustments and many other influential decisions are taken by following chain of command from lower to top of the pyramid. The executive committee and audit committee has major participation in overall decision making process. The bank maintains a continuous policy of developing its human resources. It believes that, the professionals are the key forces behind the achievement of success in banking business at the face of prevailing rigorous competitive market situation. In the expectation of continued growth, the bank established a training institute for its own staff. Southeast Bank recruits experienced bankers as well as fresh graduated and train them through the training institute. They regularly provide different training to employees in a cycle on different topic or system so that they get motivated, skilled, knowledgeable and expert in their field of operation and can adopt any new situation or element in the industry and at work. In 2011, the number of total employees stood at1848 and per branch average employee was 22. The branch is which I completed by internship has only 14 employees so it‟s better to increase the employee in number to the central point. The profit per employee has increased in years and the percentage of employees on the basis of gender is 82.58%of male and 17.42% of female. The following table shows the last five years employee number both banking and non-banking. In 2007 it was 964 and in 2011 it was 1526 on the basis of latest annual report which indicates increasing trend. 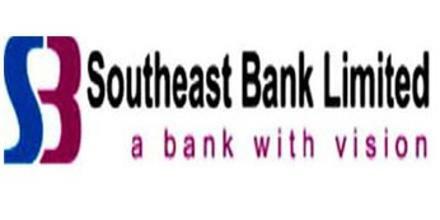 The branch network of Southeast Bank Limited has increased in last consecutive years with an increase in its human resources and cumulative income. There are 88 branches of Southeast Bank throughout the country at this moment. Of these 88 branches; 19 are rural, 15 are Agriculture, 5 are Islamic Banking branches and the rest are the Conventional Banking branches. The branches are located at various important locations and enables Southeast Bank to provide quality banking service to the clients. The amount of branch is low than it‟s close competitors if we consider the inception period of this bank. To cater to the increasing demand of client, the bank has planned to open 10 more branches, 3 offshore banking unit and 10 rural branches in important business hubs by next year. They got highest per branch profit in 2010; their branch profit has lowered in 2011 because economic downturn but the lowering means it has rise at lower rate. The bank has significant amount of correspondence with foreign banks in terms of offshore banking, foreign exchange operation and trade finance. The correspondence with the foreign banks is needed to fulfill foreign currency transaction and requirement. International correspondence in last five year was in between 590 to 650 with an increasing trend. The network with foreign banks is satisfactory. The bank has only one own subsidiary that is Southeast financial Services in London, UK from where they conduct foreign banking services directly with clients and other foreign correspondent banks. The related foreign correspondences of SEBL are located in USA, Germany, Switzerland, Canada, India, Nepal, Pakistan, UK, Australian and Japan. Among these agents, most of them are stationed at New York, Frankfurt, London, Mumbai, Kolkata and Zurich. The performance includes a descriptive evaluation on financial, operational, risk based capital position, credit based position of SEBL. The difference between authorized and paid up capital should be low to express an increase in yearly operational budget and growth motive. It means that authorized capital that is fixed by regulatory and policy-making authority has been paid in close percentage. In the last five years, the authorized capital and its use was good and satisfactory to support the operational cost requirement the whole bank. The reserve fund and capital usage requirement by central bank and policy-makers has upward movement which is good for a bank to fulfill total investment target on any emergency. Reserve and capital can term as (Tier 1 & Tier 2) where both has high level of significance in business. The increasing rate of reserve and capital has an impressive increasing rate. The amount of deposit in last five years has remarkably increased. The growth in deposit is 20% compared to last year. This growth rate might be termed as a remarkable achievement considering the volatile economic scenario of the country. Mobilization of deposits had become very competitive and as a result the average cost of fund of the banks in the private sectors had increased compared to the previous years. The bank has laid great stress on procurement of low cost fund for bringing down the average cost of fund. The bank is heavily depended on fixed deposits and more than 70% of the total deposit. More deposits mean more money to invest in business. The loans and advances of the bank recorded have an impressive growth. The advance portfolio of the bank is well diversified and covers funding to a wide spectrum of business and industries including readymade garments, textile, edible oil, ship scrapping, steel & engineering, chemicals, pharmaceuticals, cement, construction, real-estate and loans under consumers’ credit schemes allowed to the middle-class people of the country for acquiring various household items. The bank has also developed a system to improve the recovery rate of disbursed loans and also taken adequate measures for converting the classified loans into performing assets. The classified loans during the year under report was less than 2% which may be termed as encouraging in the socio-economic environment prevailing in the country. The bank gives topmost importance to acquire quality assets and does appropriate lending risk analysis while approving commercial and trade loans to clients. The investment by banks to ventures after maintaining statutory and cash reserve requirement is good though it faced a slight drop in 2010 but rise in 80% of the previous year. The portfolio of investment included Govt. Treasury Bills, Prize Bond, Shares in Public Limited Companies, etc. The Bank has always given emphasis on investment of Funds in high yield areas simultaneously maintaining Statutory Liquidity Requirement (SLR) as fixed by Bangladesh Bank. The investment income includes interest earned, dividend income, revaluation on govt. securities and capital gain. Income from import-export is volatile for political turmoil and economic breakdown. It fluctuates some time but the last year position is higher than previous year. The other incomes and volume of remittance, guarantee has an excellent climb up. In last five year the return on investment and asset was not too stable; the next years after tax profit rose two times and dropped two times. Due to economic downturn, liquidity crisis and rapid index fall; the capital market scenario is deteriorating than previous five years. The total stock volume, dividend distribution, earnings per share has a high fluctuation rate, mostly to downside in last five years. Capital adequacy requirement under the basel-2 accord was a bit above at 11.46% than margin line of 10% but the fluctuation rate was high. The capital need for managing risk weighted asset becoming tough for more or less majority of the bank these days. High rate of Capital Adequacy helps to manage risk weighted assets in dire time and managing capital expenditures. The performance of bank in terms of number of foreign correspondence, shareholders, employee and branch has high increasing trend in last five years which means the foreign trade related activities, investors‟ interest, workforce strength and network has increased. CRISL has reaffirmed AA- (pronounced as a Double A minus) rating for long term and ST-2 rating for short term to Southeast Bank Limited. The above ratings have been arrived because of strong fundamentals of the bank in the areas of capital base, operating efficiency, corporate management, ownership pattern, diversification in product line, franchise value, improvement in non-funded exposure and Soundness of management information system. This shows the long-term and short-term debt payment ability of bank to central bank, lending banks, organization and stakeholders. Banks rated in this category are adjudged to be of high quality, offer higher safety and have high credit quality. This level of rating indicates a corporate entity with a sound credit profile and without significant problems. Risks are modest and may vary slightly from time to time because of economic conditions. This means high certainty of timely payment. Liquidity factors are strong and supported by good fundamental protection factors. Risk factors are very small. It should be noted the above rating for the long term is valid for one year from the date of rating. The SWOT analysis of Southeast Bank will show internal and external influential factor both positively and negatively. It‟s the most important building block for growth to take place. After analyzing SWOT, specific inferences can be made in matrix. My job responsibility at the front desk was vast and diverse as an intern. Apart from some specific tasks, I had to perform certain tasks during the office hour. Responding to the queries in detail about different types of deposit schemes and accounts. Observation and Recommendation: – From my observation, front desk has a high potential to communicate with different level of clients. The officials of front desk have more client related responsibility than other section. The job is a mixture of good and bad experiences but all experiences can be counted. The desk demands fast, organized and perfect execution of works. The authority should permit an intern to learn and use banking software to increase their knowledge and experience levels. The most energetic, handsome and smart official should always be placed at the front desk. Authority should give small training or banking guideline of GB for best results if possible. My work at remittance and accounts desk started from 22nd February to 2nd February, 2012; under Ms. Anwara Begum-SO. Experience: – The activities of Remittance and Accounts section are normally followed by one official. So, it is very difficult task for her as well as for me to complete and coordinate the task of two sections. My job at that section started with Remittance service provided by SEBL. Different types of clients regularly come at the desk to receive the money remitted by their near and dear ones from aboard. Most of the clients of this section are female of varied age, educational qualification and profession; mostly housewives. Dealing with the clients was a bit easy than front desk as most of the clients are female and young adults. At the beginning, middle and end of month, the number of client becomes very higher. People can receive money in their bank account through SWIFT code which is international agency remits money to account. SWIFT code of SEBL, SMR is SEBD-BDDS. It takes 10- 15 days to receive money whereas remittance can give cash to hand in 4-6 days. A client or beneficiary don‟t need to pay service charges but to give name of beneficiary-remitter, national ID or Passport photocopy and PIN number of payment. There are many patterns in PIN digits which can classify and detect one agency from another. Money can be received only from branch to which the remitter has sent the money. There are 10-12 agencies doing business with SEBL but only 6 of them has got direct account in principal branches. Those are RIA, Transfast, XpressMoney, Western Union, Royal Exchange Service and Al-Ansari; these agencies have direct account in bank from which bank transfers the money to branch. If anyone wants to send money to aboard, has to contact with foreign banks like SCB, HSBC, and Citi NA etc. Identifying the proper beneficiary of payment is significant so an official asks about the name, address, amount, contact number of the client so that any fraud can occur. The bank branch will not take the responsibility of fraud. At the end of the day, payment slips of different agencies are filed into particular file for audit if needed. I also had to input all the information of payment includes name of remitter, name and address of beneficiary, contact number, paid amount, country of origin into a excel template so that data are stored in hard and soft copy and shown before the auditors of general account. The experience of accounts is also worthy to mention as account section maintains the balance sheet of the branch. The tasks of this section were sensitive; one mistake in accounting process or recoding can create many difficulties in between branch. The branch has to show the record of all transaction of different sections with full specification to head office accounts. After closing transactions at bank, officers of each section generate the voucher of types of transaction that has been completed throughout the day. The voucher is an evidence of transaction made in Cash, Transfer and Clearing mode. A voucher of transaction has three copies- account, branch and proof sheet. Then officers bring the voucher to the executive officer having power of attorney will sign at each sheet after checking them. The account will store and record the signed voucher to a register book. The most intriguing facts of accounts are variant sorts of paperwork. I found it very helpful and resourceful to learn form the affairs sheet of the branch because the account statement of bank is quite different from statements that we normally practiced in our classes. I have learned about the income-expenditure, asset-liability terms of bank. Some items are revolving in nature. Job Responsibilities: – Job responsibilities at accounts and remittance were short because of the work sensitivity. Checking the debit and credit entry in number and amount from audit trail to general accounts sheet and put on the voucher register. Observation and Recommendation: – The task of accounts is very sensitive and warrants highest attention in recording and scrutiny activities. The learning from accounts helped me to forwarding work as I know the term of balance sheet which is an accumulation of entire function of a branch. The work of credit became easy because my understanding of accounts was good. Going through different files from CIB to maintenance has helped to get idea on regular logistical and operational issues. Experience: – The clearing section clears the inwards and outwards cheque for client and branch. This work is operated by the central bank and linked directly with the clearing server of central bank. After digitization in banking and automated clearing house of central bank, it takes 6-24 hrs of any amount of cheque to clear the deposits or payment. A client can submit cheque to branch clearing within 10 AM, after that clearing server closes and the cheques that come after the hours goes to second day clearing. A high value cheque gets same day clearing and deposits by 3 PM and regular value gets clearing in next day if not placed before 11AM and deposits after 6 PM. The activities of clearing are totally controlled by automated clearing house and the transfer of money is directed from banks account at central bank. Clearing job is very risky job in physical matters, means there we had to deal with many cheques of different banks holding varied amount. Keeping and posting the cheques safely was the main challenge though the function was also very difficult and multistep process. After receiving the cheque from client, the cheques were given into the automated clearing machine to print a tracking number. The machine is a scanner and printer both actually and sounds good when works. It is compulsory to enter the cheque details like name of issuing bank with branch name, name of issuer, name of receiver, amount, cheque number, account number of depositor, contact number and clearing status. If the cheque of other bank comes at our section, then it is an outward clearing cheque and if our cheque goes to others banks clearing then its inward clearing cheque. Once the clearing section faced high risk of fraud, risk of accounting loss and risk of losing clients trust when at late noon around 8 cheques have found missing form the section which was waiting to be cleared next morning, worth a total amount of around Tk. 7 lacs. The situation was so terrible to face when it is found that cheques were not even registered in record book and didn‟t had any crossing seal of the branch. Unfortunately that was my last day at clearing and this accident occurred on that day though I took early leave for medical purpose. The officers suspected me but fortunately didn‟t blame me. The cheque was stolen by a fraud syndicate who took the advantage somehow. Then the officer in charge found guilty of irresponsible in duty but later luckily she was able to memorize the client and amount to some extent. After the office hours and following days, it was quite nuisance in the branch as we had to answer to the clients who had justified reason to become angry. Due to attentiveness and efficiency of branch authority, the necessary legal and systematic actions been taken instantly to stop the forgery and it became possible to stop any crime with cheque. I got tremendous learning from this event that how to avoid this sort of incident and what actions could be taken though I felt pity for the officer. Job Responsibilities: – An intern had little work to do at clearing because the work was highly sensitive and scheduled which was not suitable to be done by an intern. Sometimes I had to write an Inter-Bank Credit Advice (IBCA) with the help of officer and count the clearing vouchers. Observation and Recommendation: – The task of clearing warrants high level of attentiveness and safe handling of instruments because client or the branch is the owner or responsible person for that. The tasks are also interesting and I enjoyed it more than previous section. It helped me to understand the cheque transaction and inside affairs precisely that is important even if I don‟t work at bank. Experience: – Credit operation section is the busiest workstation of whole branch whose has high contribution to banks affairs and business. It directs and controls a wide array of loan-advance products and services with chunks of documentation work. The officer of this section looks free because generally less customer sits before them but the work they does has low interaction with the client. They maintains the consumer credit scheme, auto loan, project finance, working capital finance, syndicated loans and guarantees on demand of client, head office and central bank. They have to strictly follow the rules-regulation and circular of head office and central bank; report to them whatever and whenever they need. Understanding the type of client and behavioral, social, financial status is very crucial to accept his loan proposal, to enhance his limit and to apply any kind of credit practices after him. This operation is full with chunks of paper work for client, head office, central bank and other parties. The most intriguing fact was the way to deal with a credit holder and how the risk can be managed. The work involves many document analysis, report of head office and central bank. A person who is applying for credit can mislead the bank by presenting manipulated information of business, project or financial statement. He can make his equity or wealth overvalued which can put the credit into risk. Any information can be manipulated but two in can‟t be manipulated, those are the CIB report of central bank and accounts performance report. There are four step of classification, each step gives the client three months to repay and if not the bank have to lodge complain at Orthohrin Adalat of Bangladesh Supreme Court which is lengthy and hassling. Moreover, central bank should be given some percentage of classified amounts if it‟s not recovered in time and that is total loss to banks account. I tried my best to learn the paperwork; at least to learn about the pattern, purpose, prospect, content and risk associated with different papers. A proposal could 15-20 statements to be prepared totaling up to 50 pages of paper. The most disturbing task of credit operation is reporting weekly, monthly, quarterly and yearly to head office and to central bank repeatedly the same topics or item in different formats. In this section, I learned about the most important and major parts of credit operation and credit cards. Due to my interest and necessity, I spent nearly 1.5 months there. Job Responsibilities: – My job responsibilities at this section are not so worthy to mention. There was little task to complete because the works at this section was very lengthy, interlinked, consolidated and difficult. But the works that I did was very high in volume or magnitude; had intensive pressure to complete the task perfectly in due time. Observation and Recommendation: – The task of credit department is very scheduled and systematic. It has a challenge of brainwork and mental stamina to do everything successfully. The documents are the main asset of this section. It would have been better if interns have been engaged at the regular work to assist the officers and to get proper learning of credit operation practically.